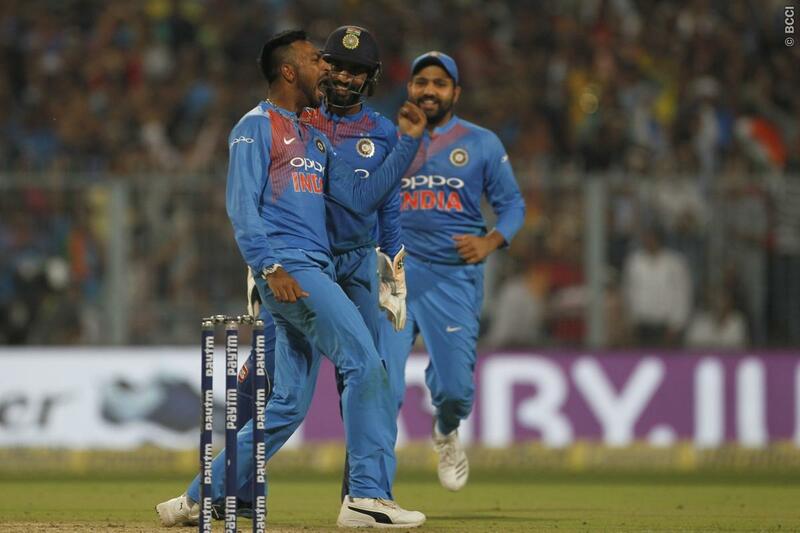 India overcame an early collapse to beat Windies by five wickets in the first T20I at the Eden Gardens to take the lead in the three-match series. Rohit Sharma’s decision to bowl first turned out to be spot on. Led by Kuldeep Yadav’s three-wicket haul, India restricted the visitors for just 109 for 8 in the allotted 20 overs. 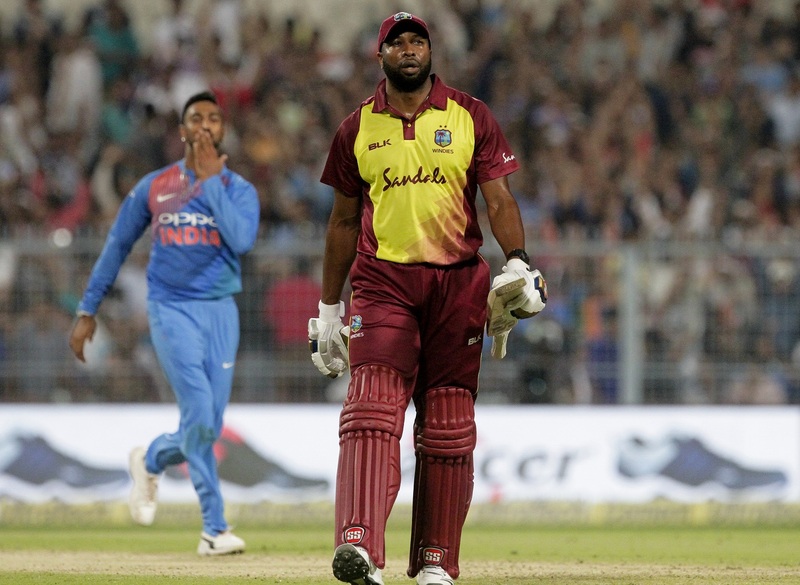 Windies, however, were not ready to throw in the towel yet as they made the match out of it. India lost both of their openers for just 16 runs on the board. They soon found themselves 4 down for 45. But Dinesh Karthik and Manish Pandey all but sealed the game with a 38-run stand before the latter departed. Karthik and debutant Krunal Pandya then took the team home inside 18 overs. 1. The win was India’s first over Windies in five attempts. The Caribbean outfit had won the last four games against the Men in Blue in the shortest format of the game. 2. Rohit Sharma became the first skipper to win nine of the first ten T20Is as skipper. Shoaib Malik, Michael Clarke, Asghar Afghan and Sarfraz Ahmed won eight of their first ten T20Is as captain while David Warner won eight of the nine T20Is in which he led Australia. 3. This was the first time India played a T20I at home without MS Dhoni in the playing eleven. The legendary batsman, who led India to the inaugural WorldT20 title, played in all the 31 T20Is that the team played in India prior to this game. The T20I was also the first for Kieron Pollard and Umesh Yadav in India. Pollard and Umesh played in 147 and 108 T20s in India but had never played an international game before. 4. Debutants Krunal Pandya, Khaleel Ahmed and Khary Pierre conceded 16 and fewer runs in this game. This is the first time three debutants conceded at an economy of 4 or less in the same T20I. 5. Krunal Pandya had a debut to remember. Elder brother of India allrounder Hardik Pandya, Krunal became only player to score over 20 runs at a strike-rate of 200+ and concede 16 or fewer runs bowling four overs in the same T20I. The other two are Pakistani duo Abdul Razzaq and Shahid Afridi. 6. Kieron Pollard scored 14 off 26 balls at a strike-rate of 53.84. It is the 3rd lowest strike-rate in a T20I inning of 25+ balls for the Windies. Dwayne Smith scored at 37.93 during his 29-ball 11 against India in the 2014 WT20 while Pollard himself made 14 off 27 at an strike-rate of 51.85 during last year’s T20I against Pakistan. 7. 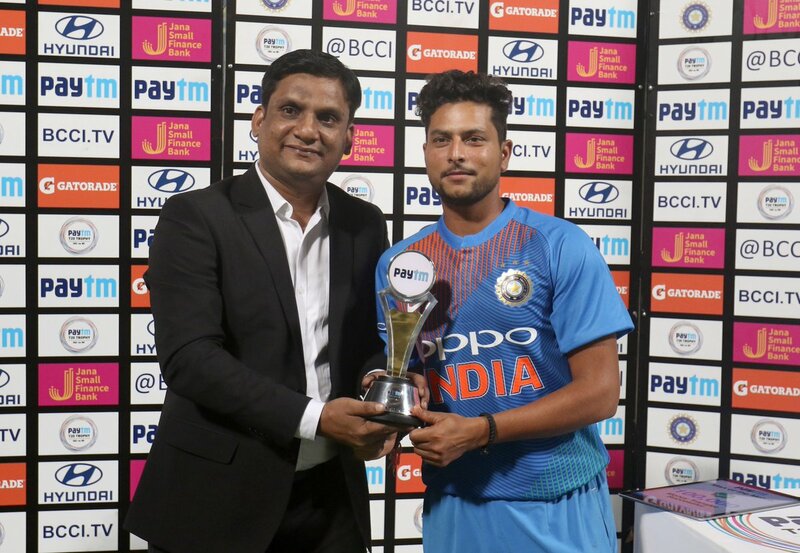 Kuldeep Yadav finished the game with 3 wickets for just 13 overs. In doing so, he completed 100 wickets in just 75 T20s. He is the joint-quickest among Indian players in terms of matches taken. Amit Mishra also achieved the feat in 75 games. WWE News: Daniel Cormier Vs. Brock Lesnar In Works For Early 2019?